U.S. Homeland Security Secretary John Kelly Monday defended recent “targeted enforcement operations” by federal authorities in areas including Los Angeles that triggered mass-deportation fears in some immigrant communities, saying the raids were aimed at criminals and people who violated immigration laws. On Tuesday, however, a scheduled meeting between House Members and the leadership of U.S. Immigration and Customs Enforcement (ICE) was abruptly cancelled, adding to concerns about ICE’s willingness to be transparent. “Frankly, ICE’s failure to meet and provide us with important information regarding ICE’s recent wave of arrests raises serious questions about the transparency of the agency’s activities,” Congresswoman Lucille Roybal-Allard (CA-40) said Tuesday. The wave of arrests last week “created fear and panic in our communities,” she said, adding that ICE has a responsibility to answer House Members’ questions and to provide a “clear and full accounting” of their actions. “Our constituents worry about what these arrests could mean for them, their families, and their friends,” Roybal-Allard said. Congresswoman Grace Napolitano (CA-32), however, said Wednesday she has since spoken to a person “high up” in the agency who she did not name, and she is confident the agency had targeted some very bad criminals. She said the agency assured her that all the actions were directed at individuals in their homes, and that the agency does not conduct raids at churches or other public locations. 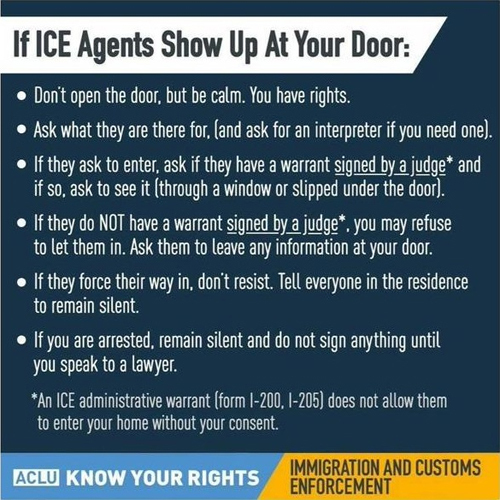 According to immigration authorities, about 161 people were detained in the weeklong Southern California operation: 95 people were arrested in Los Angeles County; 35 in Orange County; 13 in San Bernardino County; seven in Riverside County; six in Ventura County and five in Santa Barbara County. The city of Los Angeles saw the most arrests, with 37 (including nine in Van Nuys), followed by Santa Ana with 16 and Compton with six. The others were scattered around the Southland, with most cities seeing between one and four people arrested. Similar operations were conducted across the country, with more than 680 people arrested, according to federal authorities. News of the raids prompted an outcry from local immigrant-rights activists, with hundreds of people on Thursday taking their protest to the federal building in downtown L.A. Activists suggested the raids are the result of President Trump’s pledge and executive action to crack down on illegal immigration and to deport people living in the United States without authorization. In response, CHIRLA, the Coalition for Humane Immigrant Rights created a toll-free hotline — (888) 624-4752 — for affected immigrants to call for assistance and obtain access to attorneys. The group also began offering hourly training sessions to inform illegal immigrants about their legal rights. On Friday, after first denying the claims of immigrant-rights activists that as many as 100 people had been arrested, immigration authorities finally acknowledged the enforcement “surge,” but said they were “no different than the routine, targeted arrests carried out by ICE’s Fugitive Operations Teams on a daily basis.” They said the raids had been in the planning for months and were in compliance with enforcement objectives set by the Obama Administration. ICE officials insisted, however, “The rash of recent reports about purported ICE checkpoints and random sweeps are false, dangerous and irresponsible,” referring to reports circulating on social media. “These reports create panic and put communities and law enforcement personnel in unnecessary danger. Individuals who falsely report such activities are doing a disservice to those they claim to support,” said ICE officials. The bulk of those arrested were from Mexico, while others hailed from countries including El Salvador, Guatemala, China, Nicaragua, Jamaica, Honduras, Belize, Philippines, Australia, Brazil, Israel and South Korea. CHIRLA and others rebuffed ICE’s label of “criminal” applied to 150 out of the more than 160 undocumented immigrants detained. Some elected officials also criticized the immigration actions, and pledged to provide support to immigrants, and ensure they are aware of their rights. Roybal-Allard said she was “outraged” at news of the recent raids and suggested that some people who were targeted had no violent or criminal history. “It is essential that Members of Congress know the facts about these enforcement activities in order to properly inform our constituents, who deserve truth and transparency from ICE,” said Roybal-Allard, who also said she is “extremely disappointed and concerned that DHS canceled” Tuesday’s meeting with Members of Congress. Article contains information from City News Service.